As always hospitality marketers have to work doubly hard to establish themselves and keep the profits coming. Resorts are no different either, but this season they can try value building through these promotional 2x3.5 resort business card magnets square corner – 25 Mil. They can order from us with an assurance that these magnets are going to aid them in playing long innings and they are about to receive lots of freebies such as free art setup, free shipping and free design. 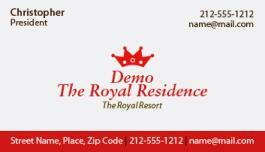 Request a quote to know discounts by bulk ordering these custom 2x3.5 resort business card magnets square corner– 25 MIL.